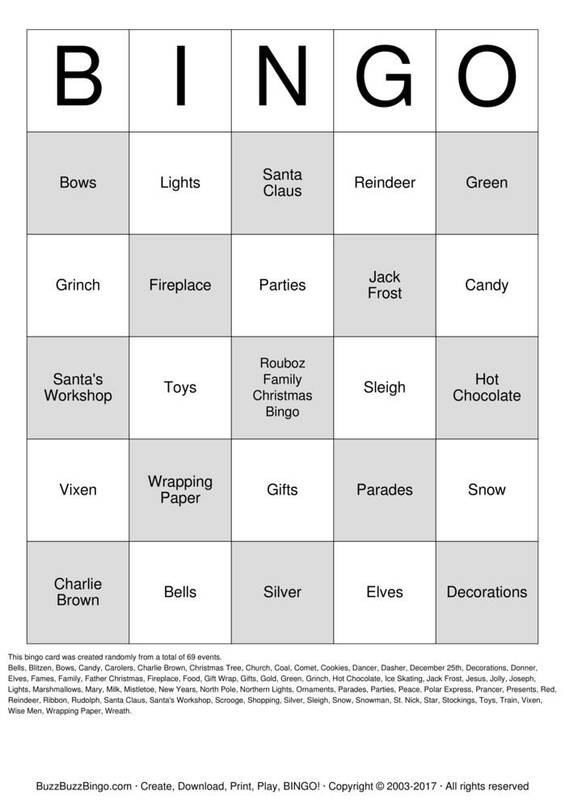 Rouboz Family Christmas Bingo Bingo Cards to Download, Print and Customize! Print 2 pages of Rouboz Family Christmas Bingo Bingo Cards for free. Download a PDF with 2 free pages of bingo cards plus instructions and a randomized call sheet. Play Rouboz Family Christmas Bingo bingo in a browser or customize the events, free space, etc. Purchase more randomly generated bingo card pages below. Bells, Blitzen, Bows, Candy, Carolers, Charlie Brown, Christmas Tree, Church, Coal, Comet, Cookies, Dancer, Dasher, December 25th, Decorations, Donner, Elves, Fames, Family, Father Christmas, Fireplace, Food, Gift Wrap, Gifts, Gold, Green, Grinch, Hot Chocolate, Ice Skating, Jack Frost, Jesus, Jolly, Joseph, Lights, Marshmallows, Mary, Milk, Mistletoe, New Years, North Pole, Northern Lights, Ornaments, Parades, Parties, Peace, Polar Express, Prancer, Presents, Red, Reindeer, Ribbon, Rudolph, Santa Claus, Santa's Workshop, Scrooge, Shopping, Silver, Sleigh, Snow, Snowman, St. Nick, Star, Stockings, Toys, Train, Vixen, Wise Men, Wrapping Paper, Wreath.